The 8 day celebration of Hanukah which takes place in December is to commemorate the re-dedication of the Temple and the miracle of the oil that occurred after the Macabees led by Judah Macabee succeeded in reclaiming the temple in Jerusalem from the Greeks. At the re-dedication of the Temple there was only enough oil to burn the eternal candle for one day. Eight days was needed to press and prepare more oil and by some miracle the flame burned for all eight days despite there only being enough oil for one day. 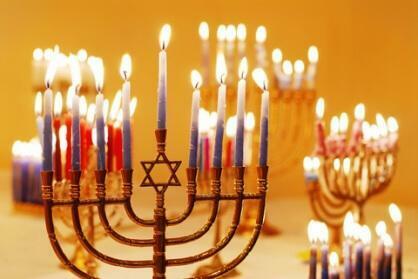 Today, Hanukah is celebrated by lighting a candle every night for 8 nights until all 8 candles are lit. The candles are placed in a Hannukah Menorah known more commonly as a "Hanukiyah" and is a nine candle candelabrum – eight candles for each day of Hanukah and the shammash (helper) candle which is used to light the other candles. Doughnuts and potato pancakes (latkes) are traditional foods eaten on Hanukah as they are cooked in oil.